Bilirubin is a yellow compound that occurs in the normal catabolic pathway that breaks down heme in vertebrates. This catabolism is a necessary process in the body's clearance of waste products that arise from the destruction of aged red blood cells. First the hemoglobin gets stripped of the heme molecule which thereafter passes through various processes of porphyrin catabolism, depending on the part of the body in which the breakdown occurs. For example, the molecules excreted in the urine differ from those in the feces. The production of biliverdin from heme is the first major step in the catabolic pathway, after which the enzyme biliverdin reductase performs the second step, producing bilirubin from biliverdin. Bilirubin is excreted in bile and urine, and elevated levels may indicate certain diseases. It is responsible for the yellow color of bruises and the yellow discoloration in jaundice. Its subsequent breakdown products, such as stercobilin, cause the brown color of faeces. A different breakdown product, urobilin, is the main component of the straw-yellow color in urine. It has also been found in plants. Bilirubin consists of an open chain tetrapyrrole. It is formed by oxidative cleavage of a porphyrin in heme, which affords biliverdin. Biliverdin is reduced to bilirubin. After conjugatation with glucuronic acid, bilirubin is excreted. Bilirubin is structurally similar to the pigment phycobilin used by certain algae to capture light energy, and to the pigment phytochrome used by plants to sense light. All of these contain an open chain of four pyrrolic rings. Like these other pigments, some of the double-bonds in bilirubin isomerize when exposed to light. This isomerization is relevant to the phototherapy of jaundiced newborns: the E,Z-isomers of bilirubin formed upon light exposure are more soluble than the unilluminated Z,Z-isomer, as the possibility of intramolecular hydrogen bonding is removed. Increased solubility allows the excretion of unconjugated bilirubin in bile. 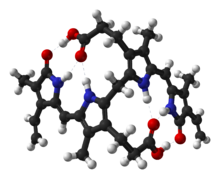 Some textbooks and research articles show the incorrect geometric isomer of bilirubin. The naturally occurring isomer is the Z,Z-isomer. Bilirubin is created by the activity of biliverdin reductase on biliverdin, a green tetrapyrrolic bile pigment that is also a product of heme catabolism. Bilirubin, when oxidized, reverts to become biliverdin once again. This cycle, in addition to the demonstration of the potent antioxidant activity of bilirubin, has led to the hypothesis that bilirubin's main physiologic role is as a cellular antioxidant. The measurement of unconjugated bilirubin is underestimated by measurement of indirect bilirubin, as unconjugated bilirubin (without glucuronidation) reacts with diazosulfanilic acid to create azobilirubin which is measured as direct bilirubin (reference https://emedicine.medscape.com/article/2074068-overview). In the liver, bilirubin is conjugated with glucuronic acid by the enzyme glucuronyltransferase, making it soluble in water: the conjugated version is the main form of bilirubin present in the "direct" bilirubin fraction. Much of it goes into the bile and thus out into the small intestine. Though most bile acid is reabsorbed in the terminal ileum to participate in enterohepatic circulation, conjugated bilirubin is not absorbed and instead passes into the colon. There, colonic bacteria deconjugate and metabolize the bilirubin into colorless urobilinogen, which can be oxidized to form urobilin and stercobilin. Urobilin is excreted by the kidneys to give urine its yellow color and stercobilin is excreted in the faeces giving stool its characteristic brown color. A trace (~1%) of the urobilinogen is reabsorbed into the enterohepatic circulation to be re-excreted in the bile. Although the terms direct and indirect bilirubin are used equivalently with conjugated and unconjugated bilirubin, this is not quantitatively correct, because the direct fraction includes both conjugated bilirubin and δ bilirubin (bilirubin covalently bound to albumin, which appears in serum when hepatic excretion of conjugated bilirubin is impaired in patients with hepatobiliary disease). Furthermore, direct bilirubin tends to overestimate conjugated bilirubin levels due to unconjugated bilirubin that has reacted with diazosulfanilic acid, leading to increased azobilirubin levels (and increased direct bilirubin). Under normal circumstances, only a very small amount, if any, of urobilinogen, is excreted in the urine. If the liver's function is impaired or when biliary drainage is blocked, some of the conjugated bilirubin leaks out of the hepatocytes and appears in the urine, turning it dark amber. However, in disorders involving hemolytic anemia, an increased number of red blood cells are broken down, causing an increase in the amount of unconjugated bilirubin in the blood. Because the unconjugated bilirubin is not water soluble, one will not see an increase in bilirubin in the urine. Because there is no problem with the liver or bile systems, this excess unconjugated bilirubin will go through all of the normal processing mechanisms that occur (e.g., conjugation, excretion in bile, metabolism to urobilinogen, reabsorption) and will show up as an increase in urine urobilinogen. This difference between increased urine bilirubin and increased urine urobilinogen helps to distinguish between various disorders in those systems. Unconjugated hyperbilirubinaemia in a newborn can lead to accumulation of bilirubin in certain brain regions (particularly the basal nuclei) with consequent irreversible damage to these areas manifesting as various neurological deficits, seizures, abnormal reflexes and eye movements. This type of neurological injury is known as kernicterus. The spectrum of clinical effect is called bilirubin encephalopathy. The neurotoxicity of neonatal hyperbilirubinemia manifests because the blood–brain barrier has yet to develop fully,[dubious – discuss] and bilirubin can freely pass into the brain interstitium, whereas more developed individuals with increased bilirubin in the blood are protected. Aside from specific chronic medical conditions that may lead to hyperbilirubinaemia, neonates in general are at increased risk since they lack the intestinal bacteria that facilitate the breakdown and excretion of conjugated bilirubin in the faeces (this is largely why the faeces of a neonate are paler than those of an adult). Instead the conjugated bilirubin is converted back into the unconjugated form by the enzyme β-glucuronidase (in the gut, this enzyme is located in the brush border of the lining intestinal cells) and a large proportion is reabsorbed through the enterohepatic circulation. In the absence of liver disease, high levels of total bilirubin confers various health benefits. Studies have also revealed that levels of serum bilirubin are inversely related to risk of certain heart diseases. "BC" "Conjugated bilirubin" Yes (bound to glucuronic acid) Reacts quickly when dyes (diazo reagent) are added to the blood specimen to produce azobilirubin "Direct bilirubin"
Note: Conjugated bilirubin is often incorrectly called "direct bilirubin" and unconjugated bilirubin is incorrectly called "indirect bilirubin". Direct and indirect refer solely to how compounds are measured or detected in solution. Direct bilirubin is any form of bilirubin which is water-soluble and is available in solution to react with assay reagents; direct bilirubin is often made up largely of conjugated bilirubin, but some unconjugated bilirubin (up to 25%) can still be part of the "direct" bilirubin fraction. Likewise, not all conjugated bilirubin is readily available in solution for reaction or detection (for example, if it is hydrogen bonding with itself) and therefore would not be included in the direct bilirubin fraction. Total bilirubin (TBIL) measures both BU and BC. Total bilirubin assays work by using surfactants and accelerators (like caffeine) to bring all of the different bilirubin forms into solution where they can react with assay reagents. Total and direct bilirubin levels can be measured from the blood, but indirect bilirubin is calculated from the total and direct bilirubin. Indirect bilirubin is fat-soluble and direct bilirubin is water-soluble. Originally, the Van den Bergh reaction was used for a qualitative estimate of bilirubin. This test is performed routinely in most medical laboratories and can be measured by a variety of methods. Total bilirubin is now often measured by the 2,5-dichlorophenyldiazonium (DPD) method, and direct bilirubin is often measured by the method of Jendrassik and Grof. Hyperbilirubinemia is a higher-than-normal level of bilirubin in the blood. For adults, this is any level above 170 μmol/l and for newborns 340 µmol/l and critical hyperbilirubinemia 425 µmol/l. Cirrhosis may cause normal, moderately high or high levels of bilirubin, depending on exact features of the cirrhosis. To further elucidate the causes of jaundice or increased bilirubin, it is usually simpler to look at other liver function tests (especially the enzymes alanine transaminase, aspartate transaminase, gamma-glutamyl transpeptidase, alkaline phosphatase), blood film examination (hemolysis, etc.) or evidence of infective hepatitis (e.g., hepatitis A, B, C, delta, E, etc.). Jaundice may be noticeable in the sclera of the eyes at levels of about 2 to 3 mg/dl (34 to 51 μmol/l), and in the skin at higher levels. For conversion, 1 mg/dl = 17.1 µmol/l. Jaundice is classified, depending upon whether the bilirubin is free or conjugated to glucuronic acid, into conjugated jaundice or unconjugated jaundice..
Urine bilirubin may also be clinically significant. Bilirubin is not normally detectable in the urine of healthy people. If the blood level of conjugated bilirubin becomes elevated, e.g. due to liver disease, excess conjugated bilirubin is excreted in the urine, indicating a pathological process. Unconjugated bilirubin is not water-soluble and so is not excreted in the urine. Testing urine for both bilirubin and urobilinogen can help differentiate obstructive liver disease from other causes of jaundice. Bilirubin was discovered by Rudolf Virchow in 1847.) It is not always distinguished from hematoidin, which one modern dictionary defines as synonymous with it but another defines as "apparently chemically identical with bilirubin but with a different site of origin, formed locally in the tissues from hemoglobin, particularly under conditions of reduced oxygen tension." Gilbert's syndrome, a genetic disorder of bilirubin metabolism that can result in mild jaundice, found in about 5% of the population. ^ "Bilirubin blood test", U.S. National Library of Medicine. ^ Pirone, Cary; Quirke, J. Martin E.; Priestap, Horacio A.; Lee, David W. (2009). "Animal Pigment Bilirubin Discovered in Plants". Journal of the American Chemical Society. 131 (8): 2830. doi:10.1021/ja809065g. PMC 2880647. PMID 19206232. ^ McDonagh, Antony F.; Palma, Lucita A.; Lightner, David A. (11 April 1980). "Blue Light and Bilirubin Excretion". Science. 208 (4440): 145–151. Bibcode:1980Sci...208..145M. doi:10.1126/science.7361112. PMID 7361112. ^ "Bilirubin's Chemical Formula". Retrieved 2007-08-14. ^ Stocker, R; Yamamoto, Y; McDonagh, A.; Glazer, A.; Ames, B. (1987). "Bilirubin is an antioxidant of possible physiological importance". Science. 235 (4792): 1043–6. Bibcode:1987Sci...235.1043S. doi:10.1126/science.3029864. PMID 3029864. ^ Baranano, D. E.; Rao, M.; Ferris, C. D.; Snyder, S. H. (2002). "Biliverdin reductase: A major physiologic cytoprotectant". Proceedings of the National Academy of Sciences. 99 (25): 16093–8. Bibcode:2002PNAS...9916093B. doi:10.1073/pnas.252626999. JSTOR 3073913. PMC 138570. PMID 12456881. ^ Sedlak, T. W.; Saleh, M.; Higginson, D. S.; Paul, B. D.; Juluri, K. R.; Snyder, S. H. (2009). "Bilirubin and glutathione have complementary antioxidant and cytoprotective roles". Proceedings of the National Academy of Sciences. 106 (13): 5171–6. Bibcode:2009pnas..106.5171s. doi:10.1073/pnas.0813132106. JSTOR 40455167. PMC 2664041. PMID 19286972. ^ Liu, Y; Li, P; Lu, J; Xiong, W; Oger, J; Tetzlaff, W; Cynader, M (2008). "Bilirubin Possesses Powerful Immunomodulatory Activity and Suppresses Experimental Autoimmune Encephalomyelitis". The Journal of Immunology. 181 (3): 1887–97. doi:10.4049/jimmunol.181.3.1887. PMID 18641326. ^ Cheifetz, Adam S. (2010). Oxford American Handbook of Gastroenterology and Hepatology. Oxford: Oxford University Press, USA. p. 165. ISBN 0199830126. ^ Moyer, Kathryn D.; Balistreri, William F. (2011). "Liver Disease Associated with Systemic Disorders". In Kliegman, Robert M.; Stanton, Bonita F.; St. Geme, Joseph W.; Schor, Nina F.; Behrman, Richard E. Nelson Textbook of Pediatrics. Saunders. p. 1405. ISBN 978-1-4377-0755-7. ^ Sedlak, T. W.; Snyder, S. H. (2004). "Bilirubin Benefits: Cellular Protection by a Biliverdin Reductase Antioxidant Cycle". Pediatrics. 113 (6): 1776–82. doi:10.1542/peds.113.6.1776. PMID 15173506. ^ Novotný, L; Vítek, L (2003). "Inverse relationship between serum bilirubin and atherosclerosis in men: A meta-analysis of published studies". Experimental Biology and Medicine. 228 (5): 568–71. doi:10.1177/15353702-0322805-29. PMID 12709588. ^ Schwertner, Harvey A.; Vítek, Libor (2008). "Gilbert syndrome, UGT1A1*28 allele, and cardiovascular disease risk: Possible protective effects and therapeutic applications of bilirubin". Atherosclerosis. 198 (1): 1–11. doi:10.1016/j.atherosclerosis.2008.01.001. PMID 18343383. ^ "Bilirubin: The Test | Bilirubin Test: Total bilirubin; TBIL; Neonatal bilirubin; Direct bilirubin; Conjugated bilirubin; Indirect bilirubin; Unconjugated bilirubin | Lab Tests Online". labtestsonline.org. Retrieved 2017-06-14. ^ Watson, D.; Rogers, J. A. (1961). "A study of six representative methods of plasma bilirubin analysis". Journal of Clinical Pathology. 14 (3): 271–8. doi:10.1136/jcp.14.3.271. PMC 480210. PMID 13783422. ^ Boris Rolinski; Küster, H; Ugele, B; Gruber, R; Horn, K (2001-10-01). "Total Bilirubin Measurement by Photometry on a Blood Gas Analyzer: Potential for Use in Neonatal Testing at the Point of Care". Clinical Chemistry. 47 (10): 1845–7. PMID 11568098. ^ "Harmonisation of Reference Intervals" (PDF). Pathology Harmony. Archived from the original (PDF) on 18 December 2014. Retrieved 23 September 2014. ^ a b Golonka, Debby. "Digestive Disorders Health Center: Bilirubin". WebMD. p. 3. Archived from the original on 1 January 2010. Retrieved 2010-01-14. ^ "Laboratory tests". Archived from the original on 13 August 2007. Retrieved 2007-08-14. ^ Stricker, Reto; Eberhart, Raphael; Chevailler, Marie-Christine; Quinn, Frank A.; Bischof, Paul; Stricker, René (2006). "Establishment of detailed reference values for luteinizing hormone, follicle stimulating hormone, estradiol, and progesterone during different phases of the menstrual cycle on the Abbott ARCHITECT® analyzer". Clinical Chemical Laboratory Medicine. 44 (7): 883–7. doi:10.1515/CCLM.2006.160. PMID 16776638. ^ "SI Units for Clinical Data". Archived from the original on 2013-10-28. Retrieved 2014-04-22. ^ "Urinalysis: three types of examinations". Lab Tests Online (USA). Retrieved 16 August 2013. ^ Lightner, David A (2013). "Early Scientific Investigations". Bilirubin: Jekyll and Hyde Pigment of Life. Progress in the Chemistry of Organic Natural Products. 98. pp. 9–179. doi:10.1007/978-3-7091-1637-1_2. ISBN 978-3-7091-1636-4.